We've had a lot of photography stuff on the blog recently and we could make excuses, but we won't! We talk about what we love, and we definitely love William Eggleston, who is now on show at the Los Angeles County Museum of Art (LACMA). The Californians are really pulling the greats out of the bag when it comes to photography this autumn, with Cartier-Bresson in San Francisco, and now Eggleston in LA. 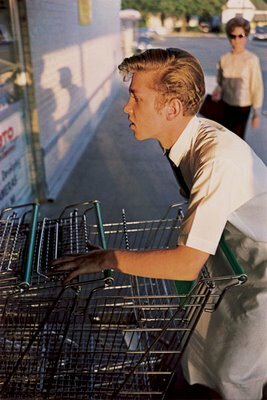 William Eggleston: Democratic Camera - Photographs and Video, 1961-2008 went on show at LACMA yesterday and will run right through until 16th January 2011. The retrospective of the Memphis-based photographers work is the most comprehensive to date, showing over 200 photographs, following Egglestons development over the space of five decades. Famed for his iconic images of familiar and everyday objects, Eggleston is credited as a pivotal figure in American photography; being at the forefront of securing a place for colour photography as an art form in the country. Spinning off our last post on Henri Cartier-Bresson, Eggleston is said to have been inspired by Cartier-Bressons work, along with that of swiss photographer Robert Frank, whose book The American's, we have already recommended for any photography fan. Eggleston himself has produced a number of books and portfolios that chart his various photographic interests and development. Finding something of interest in seemingly banal subject matter and learning to use colour to its full potential on film, Eggleston managed to create some of the most beautiful and striking images of American culture. For more information on the exhibition, visit the LACMA website.